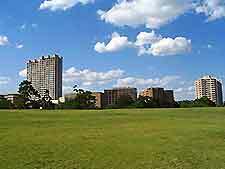 Houston boasts a plethora of green spaces and beautiful gardens within the I-610 loop, the crux of which is the massive Hermann Park near downtown Houston, containing many of the city's major attractions. 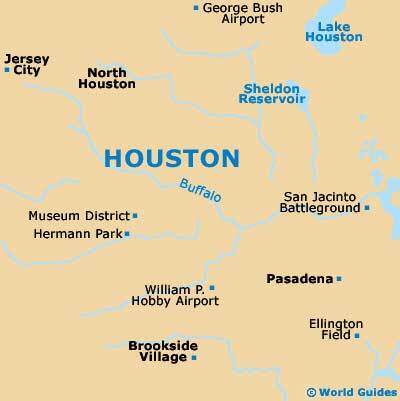 Memorial Park is a little farther out and is definitely for the sporty-type in Houston, with its jogging paths and bike trails, while Tranquility Park outside of City Hall is known for its colorful festivals and Sam Houston Park for its history. 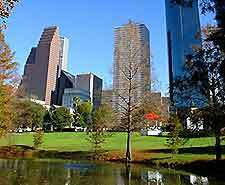 This huge park near downtown Houston and the museum district is the city's oldest park and a great place to spot many of Houston's attractions. You will find the Miller Outdoor Theater here, with its many free plays throughout the year, Houston Zoo, Houston Museum of Natural Science, a butterfly center, Japanese Garden and an 18-hole public golf course, among many other offerings in a wooded and open-air environment. 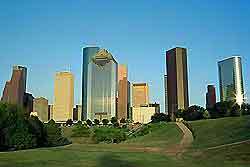 A favorite spot to the west of downtown for mountain-bikers, rollerbladers, joggers, swimmers and walkers alike, Houston's Memorial Park covers a huge area and also includes a golf course, tennis center and swimming and fitness center. There are several mountain bike trails here that are color coded according to their difficulty. The Houston Arboretum and Nature Center is the perfect place to wander and discover native Texan plants and wildlife and also features the brilliant Discovery Room, with its aquariums, huge model learning tree and other hands-on exhibits. Guided walks of the Nature Center are offered on weekends at 14:00 and 15:00 for a minimal fee. Lying among the skyscrapers of downtown Houston are numerous preserved homes from the 19th and 20th centuries, including a log cabin and a house from the period when Texas was still independent, as well as the Harris County Heritage Society, with its museum, gift shop and tearoom. The park is popular with both visitors and locals alike and the gardens offer quiet respite from the bustle of the city.